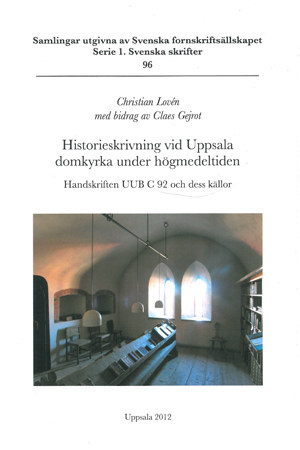 Christian Lovén, med bidrag av Claes Gejrot, Historieskrivning vid Uppsala domkyrka under högmedeltiden. Handskriften UUB C 92 och dess källor. (History writing at Uppsala Cathedral in the 13th and 14th centuries. UUB C 92 and its sources.) Uppsala 2012. Samlingar utgivna av Svenska fornskriftsällskapet. Serie 1. Svenska skrifter 96. Uppsala. 148 pp. ISBN 978-91-979881-0-0. The parchment volume C 92 in Uppsala university library contains a catalogue of popes, a list of bishops and archbishops in Uppsala, a Swedish regnal list and an annal. The four texts were written at Uppsala cathedral by one hand, with later additions by other hands. The bishops’ and kings’ lists were written around 1290, the catalogue of popes and the annal around 1305. The annal later became the starting point for the memorial book of Vadstena abbey, but it must have been kept in Uppsala at least until 1344. The Scandinavian catalogues of popes have not been scrutinized earlier and imply French contacts in the late 12th century. The list of bishops contains traces of an obituary list from Uppsala, begun in the 1160’s, and a number of entries in the annal probably derive from the same source. An analysis of the regnal list points to four different Swedish traditions in this genre, two of which were exported to Iceland before 1250. Nearly 20 historical texts, most of which have disappeared, seem to have been at hand in Uppsala before 1344. Most noteworthy are the obituary, a list of bishops begun in the 1160’s, and an annal that probably was written by the Sigtuna Dominicans around 1250. Keywords: catalogue of popes, regnal list, bishops’s list, annals, Sweden, Iceland, Denmark, Middle Ages, scriptoria, Uppsala cathedral chapter, Sigtuna Dominicans, King Valdemar’s cadaster, Hugo of Saint Victor.